The VETgirl web app is now released, and is optimized for use on any mobile device. 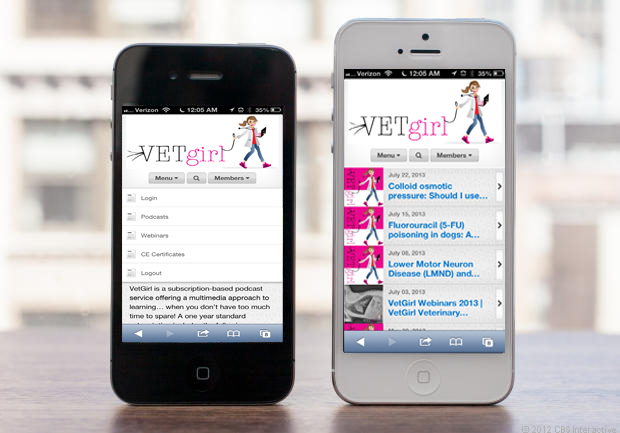 For users accessing VETgirl via a mobile device, you'll notice a completely fresh design. The web app is our most complete app to date. We regularly add new features and sections to it, including updated podcasts and blogs. More importantly, make sure to add VETgirl to your home screen, so you can easily access it. Just follow these instructions here to add it to your home screen. More importantly, make sure to log in so you have VETgirl online veterinary CE readily available at the touch of your screen. Lastly, to download our VETgirl podcasts, follow these iTunes instructions! Wow! that was easy……. love it!! !